2003-09-22 Assigned to DURECT CORPORATION reassignment DURECT CORPORATION ASSIGNMENT OF ASSIGNORS INTEREST (SEE DOCUMENT FOR DETAILS). Assignors: MILLER, STACEY S., GIBSON, JOHN W., MIDDLETON, JOHN C., TIPTON, ARTHUR J. The most common matrix materials for drug delivery are polymers. The field of biodegradable polymers has developed rapidly since the synthesis and biodegradability of polylactic acid was reported by Kulkarni et al., in 1966 (“Polylactic acid for surgical implants,”  Arch. Surg., 93:839). Examples of other polymers which have been reported as useful as a matrix material for delivery devices include polyanhydrides, polyesters such as polyglycolides and polylactide-co-glycolides, polyamino acids such as polylysine, polymers and copolymers of polyethylene oxide, acrylic terminated polyethylene oxide, polyamides, polyurethanes, polyorthoesters, polyacrylonitriles, and polyphosphazenes. See, for example, U.S. Pat. Nos. 4,891,225 and 4,906,474 to Langer (polyanhydrides), 4,767,628 to Hutchinson (polylactide, polylactide-co-glycolide acid), 4,530,840 to Tice, et al. (polylactide, polyglycolide, and copolymers), and 5,234,520 (Dunn et al., biodegradable polymers for controlled delivery in treating periodontal disease). Degradable materials of biological origin are well known including, for example, crosslinked gelatin. Hyaluronic acid has been crosslinked and used as a degradable swelling polymer for biomedical applications (U.S. Pat. No. 4,957,744 to Della Valle et al. ; (1991) “Surface modification of polymeric biomaterials for reduced thrombogenicity,”  Polym. Mater. Sci. Eng., 62: 731-735]). 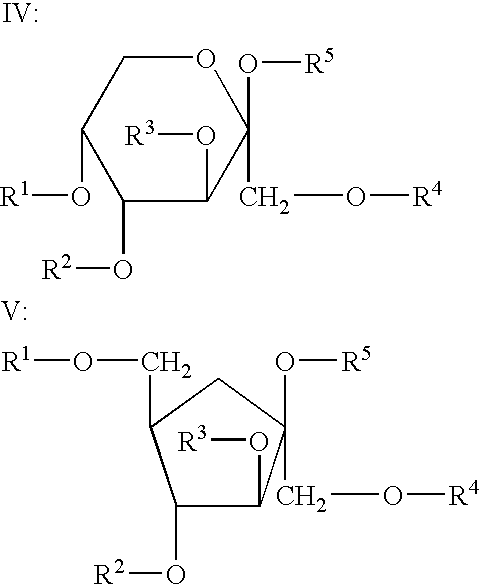 wherein R 1, R2, R3, and R4 are independently selected from the group consisting of hydrogen, alkanoyl having 2 to 6 carbons, hydroxy-substituted alkanoyl having 2 to 6 carbons, and acyloxy-substituted alkanoyl having 2 to 6 carbons, and wherein at least one of R1, R2, R3, and R4 is other than hydrogen. The alcohol moiety of the ester or mixed ester may be derived from a polyhydroxy alcohol having from about 2 to about 20 hydroxy groups, and as indicated above, may be formed by etherifying 1 to 20 polyol molecules. Suitable alcohol moieties include those derived by removing one or more hydrogen atoms from: monofunctional C 1-C20 alcohols, difunctional C1-C20 alcohols, trifunctional alcohols, hydroxy-containing carboxylic acids, hydroxy-containing amino acids, phosphate-containing alcohols, tetrafunctional alcohols, sugar alcohols, monosaccharides, and disaccharides, sugar acids, and polyether polyols. More specifically, the alcohol moieties may include one or more of: dodecanol, hexanediol, more particularly, 1,6-hexanediol, glycerol, glycolic acid, lactic acid, hydroxybutyric acid, hydroxyvaleric acid, hydroxycaproic acid, serine, ATP, pentaerythritol, mannitol, sorbitol, glucose, fructose, sucrose, glucuronic acid, polyglycerol ethers containing from 1 to about 10 glycerol units, polyethylene glycols containing 1 to about 20 ethylene glycol units. wherein R 1, R2, R3, and R4 are independently selected from the group consisting of hydrogen, alkanoyl, hydroxy-substituted alkanoyl, and acyloxy-substituted alkanoyl. The acyl groups forming the acyloxy substituents of the invention may be any moiety derived from a carboxylic acid in accordance with the commonly accepted definition of the term “acyl.” More particularly, the acyl groups of the compositions of the invention may be of the form R 9CO—, where R9 is optionally oxy-substituted alkyl of 2-6 carbon atoms. This oxy-substitution may take the form of hydroxy substitution, or substitution with additional acyl moieties. For example R9 may be an oligomer of oxy-substituted carboxylic acids, linked by ester bonding between the hydroxy of one acid and the carboxy of another acid. In a more particular example, R9 may comprise 1 to 5 lactide or glycolide units, where a lactide unit contains two lactic acid moieties esterified together and a glycolide unit contains two glycolic acid moieties esterified together. Alternatively, R9 may contain mixed lactide and glycolide units, or may contain mixed lactic acid and glycolic acid, without the presence of lactide or glycolide units. Particular HVLCM materials include components according to formulae II or III, wherein R 1, R2, and R3 are independently lactoyl, polylactoyl, ε-caproyl, hydroxyacetyl, or polyhydroxyacetyl, in particular, polylactoyl and ε-caproyl, or polylactoyl and polyhydroxyacetyl. Examples of preferred antigens include viral proteins such as influenza proteins, human immunodeficiency virus (HIV) proteins, and hepatitis A, B, or C proteins, and bacterial proteins, lipopolysaccharides such as gram negative bacterial cell walls and  Neisseria gonorrhea proteins, and parvovirus. The composition of the invention can also be used to elicit both mucosal and systemic immune responses by administration of the HVLCM of the invention, optionally with a solvent to decrease its viscosity as described above, in combination with an immunogenic material, in a vaccine that is administered to a mucosal surface, e.g., intranasally, intravaginally, or intrarectally. The immunogenic material may be any immunogenic agent whose delivery to mucosal tissue is desired. In an even more particular aspect of this embodiment, the HVLCM or LVLCM is selected from formulae II through VIII above. Vaccines of this type can be prepared and administered by delivering an immunogenic material to the mucosal tissues, particularly to the mucosally associated lymphoid tissues of animals, particularly mammals. Administering immunogenic materials, in particular, immunogenic material combined with a carrier containing the non-polymeric, non-water-soluble, high viscosity liquid and a solvent therefore to the folliculi lymphatic aggregati which are found in the mucosal tissues can be an effective delivery technique. The solvent rapidly dissipates, resulting in a highly viscous liquid formulation that holds the immunogenic material over the muscosal tissue and allows the immunogenic material to stimulate a mucosal immune response and/or a systemic immune response. Administration of the formulation may include aerosolizing the formulation or a water emulsion thereof and administering this formulation intranasally, intravaginally (e.g., as a douching liquid, vaginal suppository, or bougie), or intrarectally (e.g., as an enema, suppository or bougie). In particular embodiments, the solvent can be, or the formulation can include, a penetration enhancer that facilitates the absorption of the immunogenic material into the lymphatic tissue. The non-polymeric, non-water-soluble, high viscosity liquid material provides controlled release of the immunogenic material from a viscous liquid film that forms over the lymphoid tissue. The immunogenic material may be any immunogenic agent whose delivery to mucosal tissue, and in particular to mucosally associated lymphoid tissue (MALT), is desired. Even more particularly, the mucosal tissue may be nasally associated lymphoid tissue, Waldeyer's ring, or analogous tissue in non-human species. Examples of suitable immunogenic materials include, but are not limited to, antigens to vaccinate against viral, bacterial, protozoan, fungal diseases such as respiratory syncytial, parainfluenza viruses,  Hemophilus influenza, Bordetella pertussis, Neisseria gonorrhoeae, Streptococcus pneumoniae, and Plasmodium falciparum or other diseases caused by pathogenic micro-organisms, antigens to vaccinate against diseases caused by macro-organisms such as helminthic pathogens, antigens to vaccinate against allergens. Preferably, for pharmaceutical or veterinary purposes, the present compositions are administered as liquids via injection, or in an aerosol, paste or emulsion. When administered via injection as a LVLCM, if a water-soluble solvent has been used in the composition, the solvent leaches into the aqueous fluid of the host, forming a highly viscous depot for the controlled delivery of substances or a coating for tissue that can prevent or minimize adhesions. As explained above, the use of a water soluble solvent in making the LVLCM significantly decreases the leaching time. When used in an aerosol, the small amount of solvent in the solution evaporates upon application allowing the LVLCM to set-up as an HVLCM. Alternatively, the aerosol or emulsion may be prepared without a solvent. In this situation, the aerosol propellant can also function as a solvent. Formation of aerosols and emulsions can be accomplished using techniques known to those skilled in the art. See, for example, Ansel, H. C. et al.,  Pharmaceutical Dosage Forms and Drug Delivery Systems, sixth ed., 1995. A clean, one liter glass reaction flask was fitted with a stainless steel mechanical stirrer rinsed with acetone, and dried for 3 hours under 0.5 mm Hg vacuum, while immersed in a 150° C. oil bath. The reaction vessel was removed from the bath, allowed to cool, then charged with 197.5 grams (1.37 mol) of DL-Lactide, 52.5 grams (0.46 mol) of ε-Caprolactone, and 40 grams (0.34 mol) of 1,6-Hexanediol. Following addition, the reaction flask was purged 5 times with nitrogen, and immersed in the oil bath at 150° C. The mixture was stirred slowly after a majority appeared to have been melted to facilitate phase change. After all contents had melted, 1.28 mL (210 μmol) of a 0.164M stannous 2-ethylhexanoate solution in toluene was added. Stirring continued to disperse the catalyst for a period of approximately 1 hour. The solution was maintained, without stirring, for 18 hrs. at 150° C. The resulting compound was then dried under vacuum (<0.5 mm Hg) at 150° C. for a period of 4-5 hours to remove any unreacted starting materials, with slow stir speed applied. The resulting product had an inherent viscosity of 0.049 dL/g in CHCl 3 at 30° C.
The procedure detailed in Example 1 was used to prepare a material using 247.13 g (1.71 mol) DL-Lactide, 62.87 g (0.54 mol) Glycolide, and 49.6 g (0.42 mol) 1,6-Hexanediol. Following initial melting, 1.84 mL (260 μmol) of a 0.141M stannous 2-ethylhexanoate solution in toluene was added. The resulting product had an inherent viscosity of 0.058 dL/g in CHCl 3 at 30° C. The material was a liquid at room temperature. The procedure described in Example 1 was used to prepare a material using 198.14 g (1.37 mol) DL-Lactide, 54.8 g (0.47 mol) ε-caprolactone, and 40 g (0.43 mol) Glycerol. Following initial melting, 1.36 mL (210 μmol) of a 0.154M stannous 2-ethylhexanoate solution in toluene was added. The resulting product had an inherent viscosity of 0.038 dL/g in CHCl 3 at 30° C. The product was a liquid at room temperature. The procedure described in Example 1 was used to prepare a compound using 247.33 g (1.72 mol) DL-Lactide, 62.87 g (0.54 mol) Glycolide, and 50.0 g (0.54 mol) Glycerol. Following initial melting, 1.46 mL (260 μmol) of a 0.179M stannous 2-ethylhexanoate solution in toluene was added. The resulting product had an inherent viscosity of 0.028 dL/g in CHCl 3 at 30° C. The material was a liquid at room temperature. Ground lysozyme (10 wt %) was suspended in SAIB/solvent mixtures including the solvents ethyl lactate, N-methyl-2-pyrrolidone (NMP), MIGLYOL 810, and benzyl benzoate. 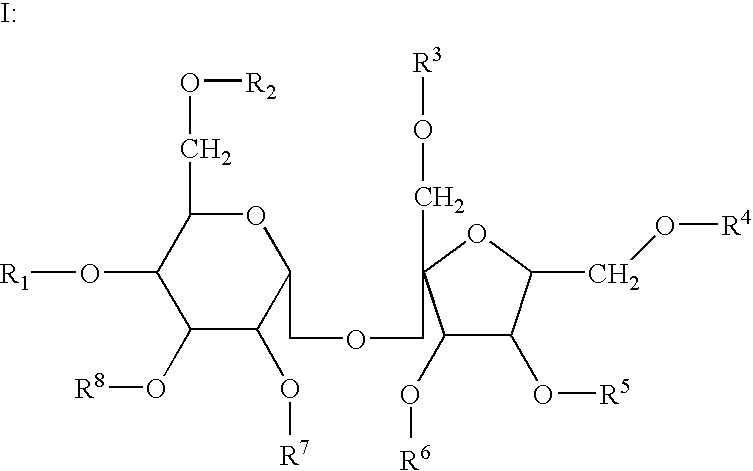 Three poly (DL-lactide-co-glycolide) polymers with either acid, ester, or PEG end groups were evaluated as additives. To determine release rates, drops of formulation were injected into test tubes with pH 6.24 buffer and then incubated in a shaker at 37° C. At certain times, aliquots of buffer were removed and replaced with fresh buffer. Lysozyme concentration in buffer was determined by the BCA protein assay. Protein activity was determined with an enzymatic assay measuring cell lysis of a suspension of  Micrococcus lysodeikticus spectrophotometrically. Decrease in absorbance at 450 nm was recorded as a function of time, which is directly related to active lysozyme concentration. (b) a biologically active substance. 2. The composition of claim 1, wherein the non-polymeric non-water soluble liquid carrier material is present in an amount from about 95 percent to about 10 percent by weight, relative to the total weight of the composition. 3. The composition of claim 2, wherein the non-polymeric non-water soluble high viscosity liquid carrier material is present in an amount from about 85 percent to about 25 percent by weight, relative to the total weight of the composition. 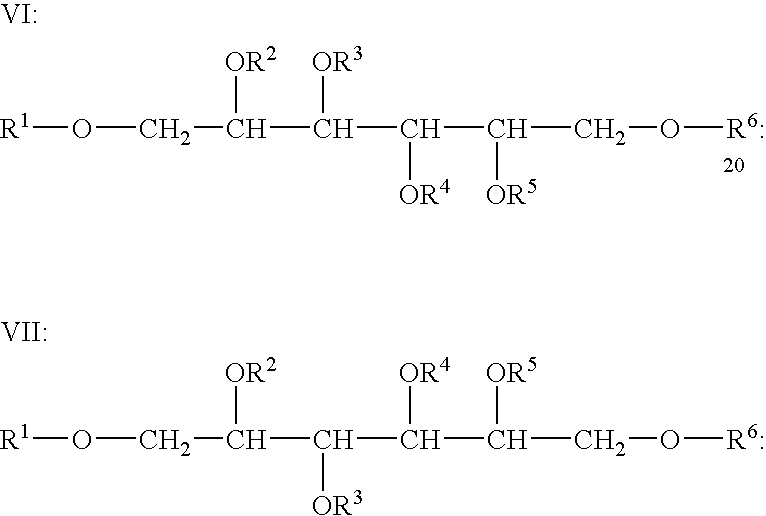 (c) a solvent in which the non-polymeric non-water insoluble liquid carrier material is soluble. 5. The composition of claim 4, wherein the solvent is selected from the group consisting of ethanol, dimethylsulfoxide, benzyl benzoate, benzyl alcohol, polyethylene glycol, glycerol triacetin, triethyl citrate, ethyl lactate, ethyl acetate, benzyl alcohol, triacetin, 2-pyrrolidone, N-methylpyrrolidone, propylene carbonate, and glycofurol. 7. The composition of claim 6, wherein the additive is selected from the group consisting of biodegradable polymers, non-biodegradable polymers, natural oils, synthetic oils, carbohydrates, inorganic salts, and inert organic compounds. 8. The composition of claim 4, wherein the solvent is present in an amount from about 10 to about 50 percent by weight, relative to the weight of the composition. (c) a solvent in which the non-polymeric non-water soluble liquid carrier material is insoluble or sparingly soluble. 10. The liquid emulsion of claim 9, wherein the high viscosity liquid carrier material is in the dispersed phase. 11. The liquid emulsion of claim 10, wherein the dispersed phase comprises a mixture of sucrose acetate isobutyrate and a solvent therefore, and the continuous phase comprises water, glycerol, or a combination thereof. 12. The liquid emulsion of claim 9, wherein the high viscosity liquid carrier material is in the continuous phase. 14. The composition of claim 13, wherein the additive is selected from the group consisting of biodegradable polymers, non-biodegradable polymers, natural oils, synthetic oils, carbohydrates, inorganic salts, and inert organic compounds. 15. The composition of claim 13, wherein the additive is present in an amount in the range from about 1 to about 20 percent by weight, relative to the total weight of the composition. 16. 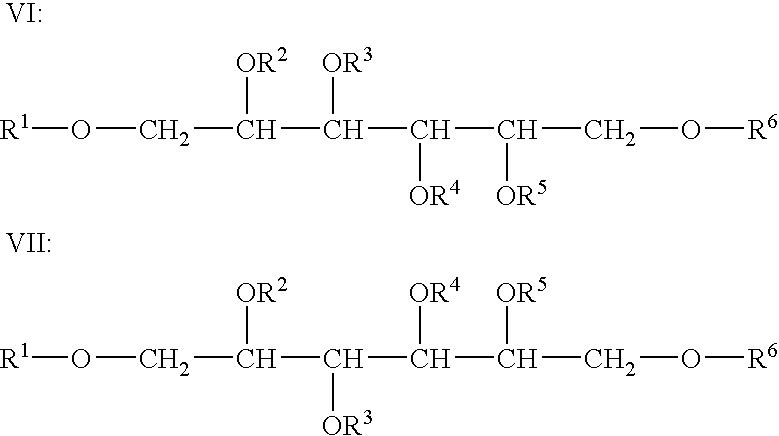 The composition of claim 13, wherein the additive is cellulose, a cellulose ester, or a cellulose ether. 17. The composition of claim 16, wherein the additive is cellulose acetate butyrate. 18. The composition of claim 16, wherein the additive is cellulose acetate propionate. 19. The composition of claim 13, wherein the additive comprises a poly(lactide). 20. The composition claim 13, wherein the additive is poly(caprolactone). 21. The composition of claim 13, wherein the additive is poly(D,L-lactic acid). 22. The composition of claim 13, wherein the additive comprises a poly(lactide-co-glycolide). 23. The composition of claim 13, wherein the additive is a poly(glycolide). 24. The composition of claim 13, wherein the additive is oxidized cellulose. 25. The composition of claim 13, wherein the additive is a nonbiodegradable polymer. 26. The composition of claim 13, wherein the additive is a biodegradable polymer. 27. The composition of claim 13, wherein the additive is polyvinyl pyrrolidone. 28. The composition of claim 13, wherein the additive is polyethylene glycol. 29. The composition of claim 13, wherein the additive is sesame oil. 30. The composition of claim 13, wherein the additive is a carbohydrate. 31. The composition of claim 30, wherein the additive is sucrose. 33. The composition of claim 32 suitable for topical administration. 34. The composition of claim 32 suitable for systemic administration. 35. The composition of claim 32 suitable for parenteral administration. 36. The composition of claim 32, suitable for rectal administration. 37. The composition of claim 32, suitable for vaginal administration. 38. The composition of claim 32, suitable for nasal administration. 39. The composition of claim 32, suitable for oral administration. (c) a lower viscosity liquid carrier material. 41. The composition of claim 40, wherein the lower viscosity liquid carrier material has a viscosity of less than 1000 cp. 42. The composition of claim 40, wherein the lower viscosity liquid carrier material comprises a mixture of a high viscosity liquid carrier material and a solvent therefore. (b) a biologically active substance useful for agricultural, human therapy, veterinary, or pesticidal purposes, or a combination thereof. 44. The composition of claim 43, wherein the biologically active substance is useful for agricultural purposes. 45. The composition of claim 43, wherein the biologically active substance is useful for human therapy purposes. 46. The composition of claim 43, wherein the biologically active substance is useful for veterinary purposes. 47. The composition of claim 43, wherein the composition is useful for the control of pests. 48. The composition of claim 47, wherein the active agent is useful for the control of weeds. 49. The composition of claim 47, wherein the active agent is useful for the control of insects. (b) a biologically active substance wherein the biologically active substance is a drug. 51. The composition of claim 50, wherein the biologically active agent is theophylline. 52. The composition of claim 50, wherein the biologically active agent is flurbiprofen. 53. The composition of claim 50, wherein the biologically active agent is naproxen. 54. The composition of claim 50, wherein the biologically active agent is chlorhexidine. 55. The composition of claim 50, wherein the biologically active agent is diclofenac. 56. The composition of claim 50, wherein the biologically active substance is an anesthetic. 57. The composition of claim 56, wherein the anesthetic is selected from the group consisting of benzocaine, bupivacaine, chloroprocaine, etidocaine, levobupivacaine, lidocaine, mepivacaine, pramoxine, prilocaine, procaine, proparacaine, ropivacaine, and tetracaine. 58. The composition of claim 57, wherein the anesthetic is bupivacaine. 59. The composition of claim 55, further comprising an augmenting agent. 60. The composition of claim 59, wherein the augmenting agent is selected from the group consisting of dexamethasone, epinephrine, and combinations thereof. 61. The composition of claim 50, wherein the biologically active agent is a hormone. 62. The composition of claim 50, wherein the biologically active material is a steroid. 63. The composition of claim 62, wherein the biologically active compound is an estrogen. 64. The composition of claim 62, wherein the biologically active agent is a progesterone. 65. The composition of claim 62, wherein the biologically active agent is 17-β-estradiol. 66. The composition of claim 62, wherein the biologically active agent is a progesterone and estradiol in combination. 67. The composition of claim 50, wherein the biologically active agent is dexamethasone. 68. The composition of claim 50, wherein the biologically active agent is an antipsychotic. 69. The composition of claim 50, wherein the biologically active agent is an antibiotic. 70. The composition of claim 69, wherein the biologically active agent is tetracycline. 71. The composition of claim 69, wherein the biologically active agent is azithromycin. 72. The composition of claim 69, wherein the biologically active material is doxycycline. 73. The composition of claim 50, wherein the biologically active agent is a growth factor. 74. The composition of claim 73, wherein the biologically material is transforming growth factor-beta. 75. The composition of claim 50, wherein the biologically active substance is a chemotherapeutic agent. 76. The composition of claim 50, wherein the biologically active molecule is heparin. (b) a biologically active substance selected from the group consisting of peptides, proteins, nucleoproteins, mucoproteins, lipoproteins, and synthetic polypeptides. 78. The composition of claim 77, wherein the biologically active compound is a peptide. 79. The composition of claim 77, wherein the biologically active compound is a protein. 80. The composition of claim 79, wherein the protein is selected from the group consisting of α-interferon and β-interferon. (b) a biologically active substance selected from the group consisting of a nucleic acid, a nucleotide, nucleoside, or oligonucleotide. 82. The composition of claim 81, wherein the biologically active agent is a nucleoside or nucleotide. (b) a biologically active substance which is a gene. (b) a biologically active substance selected from the group consisting of a vaccine, a lipid, and a vitamin. 85. The composition of claim 84, wherein the biologically active agent is a vaccine. 86. The composition of claim 84, wherein the biologically active material is a lipid. 87. The composition of claim 84, wherein the biologically active material is a vitamin. wherein the composition is useful to control lice, to control dandruff, as a tissue adhesive, or in wound healing. 89. The composition of claim 88, wherein the composition is useful to control lice. 90. The composition of claim 88, wherein the composition is useful to control dandruff. 91. The composition of claim 88 useful as a tissue adhesive. 92. The composition of claim 88 useful in wound healing. (b) a non-water soluble solvent in which the non-polymeric non-water insoluble liquid carrier material is soluble. 94. The liquid composition of claim 93, wherein the solvent is selected from the group consisting of benzyl benzoate, caprylic/capric triglycerides, benzyl alcohol, and triethylcitrate. 95. The liquid composition of claim 94, wherein the solvent is benzyl alcohol. 96. The composition of claim 68, wherein the antipsychotic comprises olanzapine, risperidone, or a combination thereof. 97. The composition of claim 50, wherein the drug comprises a statin. 98. The composition of claim 97, wherein the statin is selected from the group consisting of atorvastatin, cerivastatin, fluvastatin, lovastatin, pravastatin, and simvastatin. 99. The composition of claim 50, wherein the drug comprises an antiasthmatic. 100. The composition of claim 99, wherein the antiasthmatic comprises a cromolyn. 101. The composition of claim 50, wherein the drug comprises a narcotic antagonist. 102. The composition of claim 50, wherein the drug comprises a bone resorption prevention agent. 103. The composition of claim 102, wherein the bone resorption prevention agent is selected from the group consisting of alendronate, risendronate, zolendronate, pamidronate, and ibandronate. 104. The composition of claim 61, wherein the hormone comprises a calcium regulating hormone. 105. The composition of claim 50, wherein the drug comprises a cardiac agent. 106. The composition of claim 105, wherein the cardiac agent comprises an antiarrhythmic agent, an antiangina agent, or an antihypertensive agent. 107. The composition of claim 13, wherein the additive comprises a multivalent metal. 108. The composition of claim 107, wherein the multivalent metal comprises zinc ion. wherein the carrier material and biologically active substance are maintained in separate containers, and are capable of forming a homogeneous solution on mixing. 110. The composition of claim 32, further comprising a polymeric excipient. 111. The composition of claim 110, comprising one or more particles comprising the biologically active substance and the polymeric excipient. 112. The composition of claim 110, wherein the composition is in the form of a microsphere. 113. The composition of claim 110, wherein the composition is orally administrable. 114. The composition of claim 32, wherein the biologically active substance forms a particle with an optional solid additive. 115. The composition of claim 114, wherein the solid additive comprises calcium phosphate. and wherein the active agent containing chamber contains the formulation of claim 1. 117. The delivery system of claim 116, wherein the system is implantable into the patient's tissue. 118. The delivery system of claim 116, wherein the system is orally administrable.